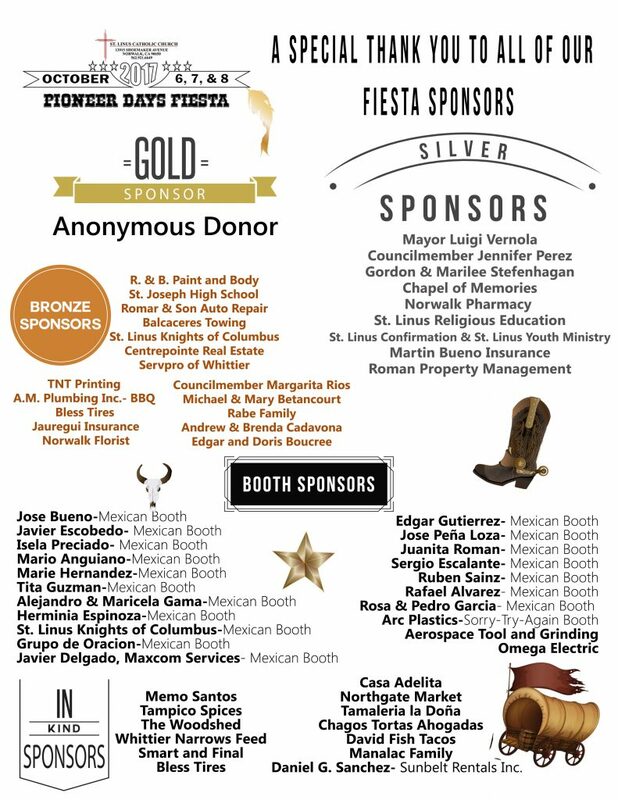 Thank you in advance for your interest in becoming a Sponsor of St. Linus Catholic Church Fiesta 2017, Pioneer Days! We are grateful for the opportunity to partner with major strategic sponsors who help support our parish and the thousands of families and individuals which it serves. To become a St. Linus Fiesta Sponsor, simply download the Sponsorship Agreement Form below and submit it to our Parish Office. If you have any questions, please contact the Parish Office (562) 921-6649. We look forward to working with our highly valued Sponsors in order to serve the Norwalk community! A SPECIAL THANK YOU TO OUR 2017 FIESTA SPONSORS!